Opus Affair is an arts networking and marketing organization that organizes monthly networking events. Online membership is free and open to anyone. With the help of our client, we used a screener survey to recruit Opus Affair members for interviews. Quite a few were delighted to chat about their memorable experiences with Opus Affair. "I am very involved in Opus Affair"
"I have made important connections at these networking events." 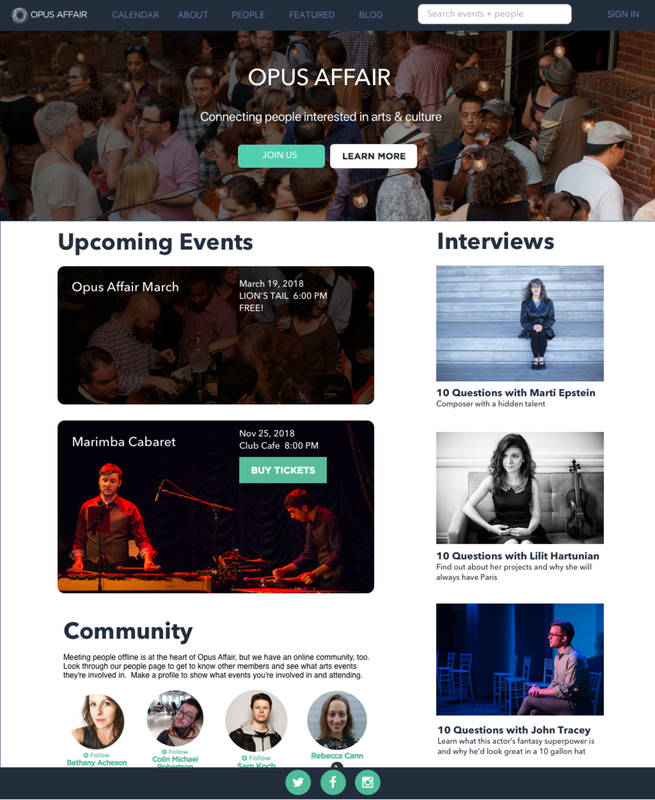 Opus Affair’s website has a calendar system that is confusing for users and does not easily encourage the use of profile features, so users are not utilizing on-site event registration that would encourage more users to attend events by knowing that their friends are also attending. By updating and improving the calendar functionality and tying it into a user profile system with improved visibility and social connectivity options, we will provide Opus Affair with a robust tool for improving the visibility and attendance encouragement of Opus Affair events between members, which will provide both increased event attendance and easier ways to bring in new members. We will know this to be true when implementation of the new calendar and profile functions significantly improves member registration for events, and users start utilizing new features that allow them to share what events they will attend. 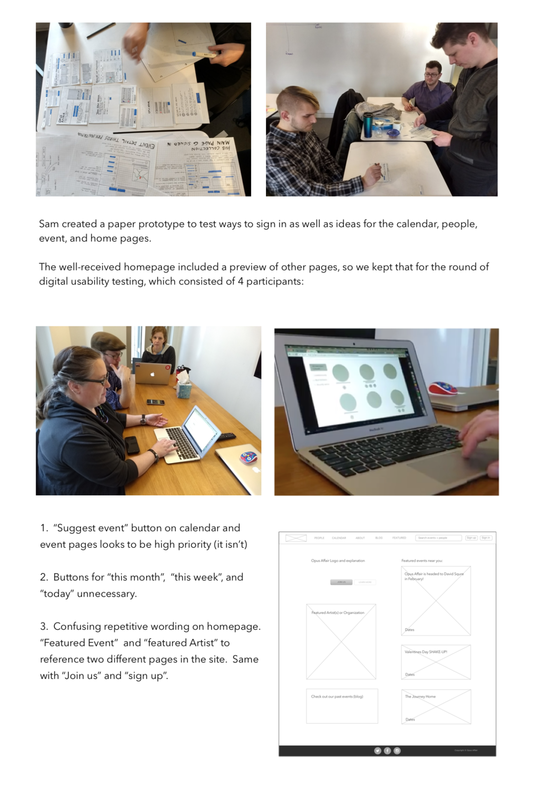 We sketched out ideas to solve the identified issues with the current website. The focused on changing the home, calendar, and profile pages based on user and business goals. This project focused on strategically integrating new features and enhancing existing features, such as the calendar sorting options. 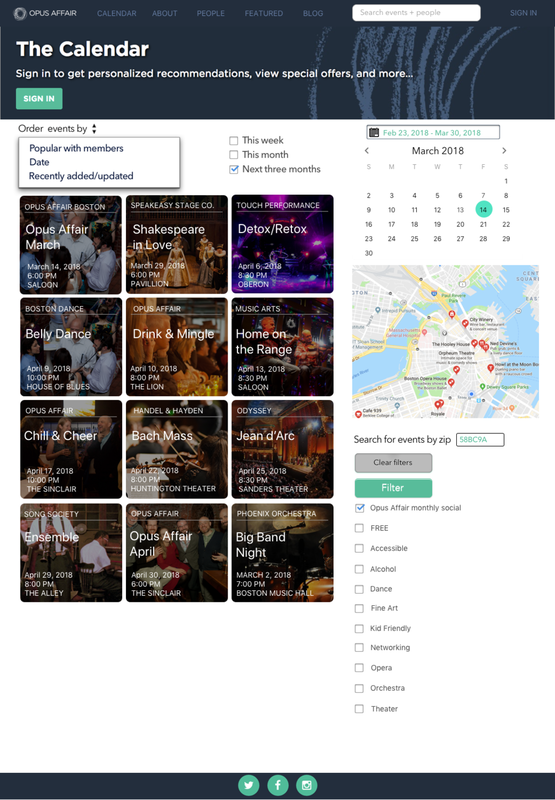 The main user and business goals included making the calendar easier to interpret, specifying event participation via RSVP, make user profiles more interesting, connecting members, and searching for events based on location. Keeping the website true to the Opus Affair brand, we implemented a simple green highlight on the calendar sorting feature to make it more obvious to users. We also implemented a map to filter events by zip code. For the event pages that include the RSVP dropdown, we included a fill-in-the-blank option to indicate event involvement. For profiles, we included interesting questions to gather and display fun information about members (example: "If you had one superpower, what would it be? ").